This 20 minute Indian Quinoa Recipe with lentils and vegetables will be your new favourite way to eat quinoa. Most of us absolutely love some of our traditional foods that also double up as comfort foods. But these comfort foods are usually carb heavy, using refined or processed ingredients. While it is completely ok to indulge in them, eating them on a regular basis can send our healthy eating plans for a toss. 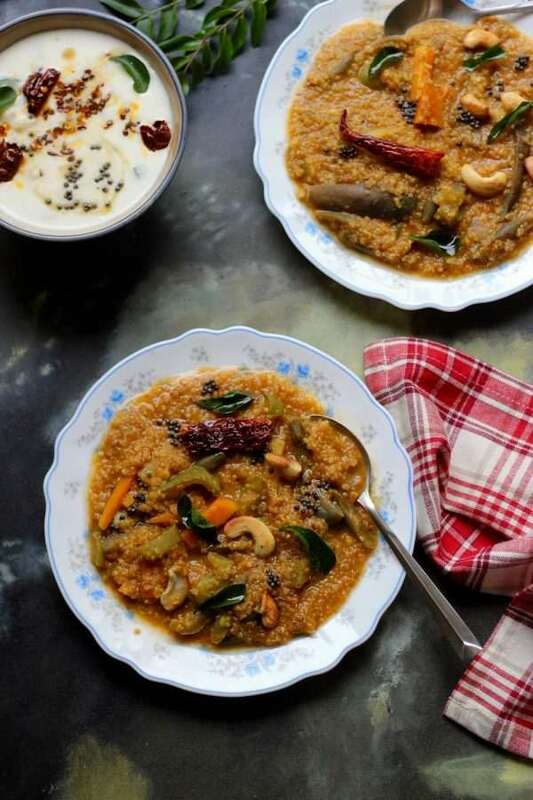 This is why I came up with this Quinoa Sambar Sadham or a quinoa version of sambar rice. The recipe uses quinoa instead of white polished rice. 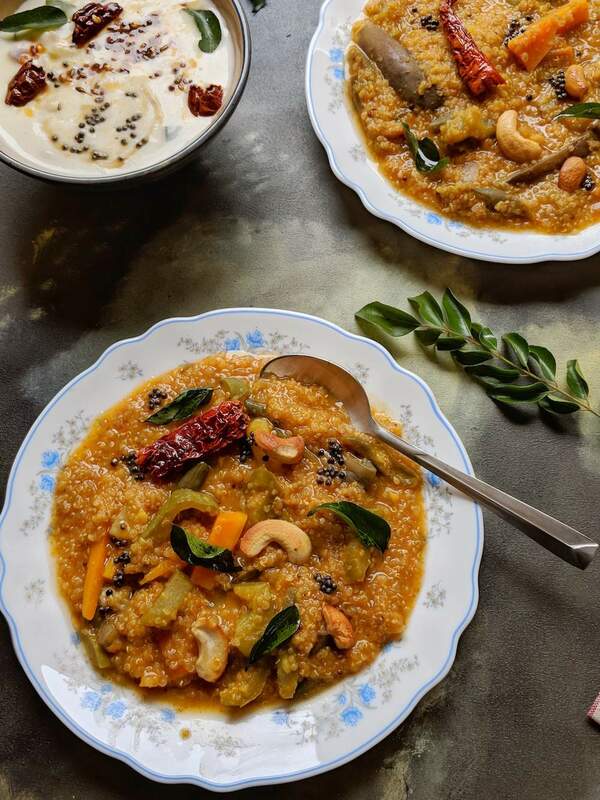 This Indian quinoa recipe will hit the spot whether you are a South Indian looking for a healthier version of comfort food or even if you are a vegan looking for more main course recipe ideas using quinoa. This South Indian quinoa recipe is a one pot dish – hearty, full of flavours and easy to make for a big family. You can also prepare this ahead and top it with a fresh tempering of curry leaves, mustard seeds and cashews just before serving. So now let give you the details of Quinoa Sambar Sadham or South Indian style quinoa and lentil stew. Sambar is a staple lentil based preparation in Tamil (South Indian) cuisine which has one or more vegetables, tamarind and yellow lentils (toor dal). 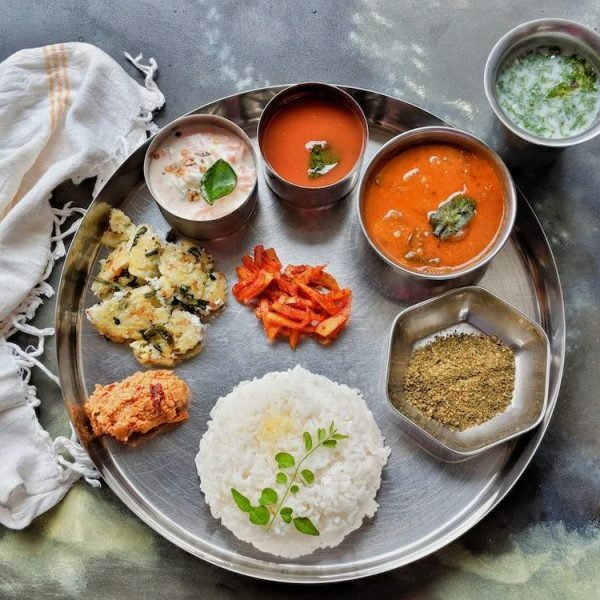 There is a special spice blend (sambar powder) that is used to give the dish its characteristic, rather complex flavour. For Sambar saadham, rice is cooked until somewhat mushy (using more than usual water). Sambar is prepared using a mix of vegetables like onion, carrot, eggplant, beans etc. and cooked yellow lentils. The rice and sambar are mixed well and allowed to sit for a couple of hours until the rice absorbs all the flavours from the sambar. 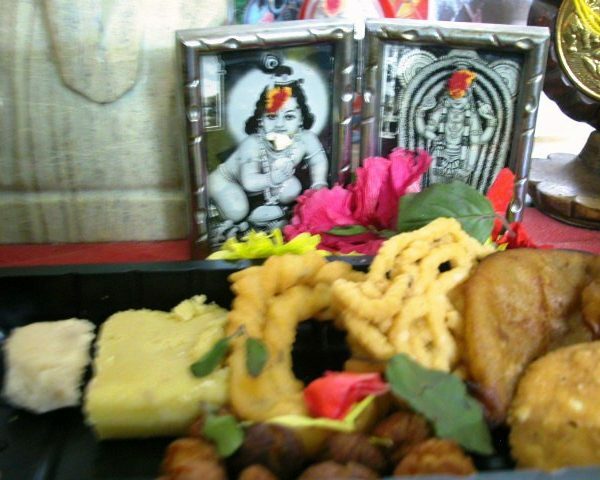 A tempering of curry leaves, red chilies and cashew nuts adds a final layer of flourish to this already delicious dish. To prepare sambar sadham with quinoa, I have tweaked the process a little. Cooking quinoa until nearly done and finishing off the cooking process by adding it to the prepared sambar (lentil stew) allows it to absorb the flavours better. Do watch these two videos which explain how to make a traditional sambar as well as how to cook dal in a pressure cooker. 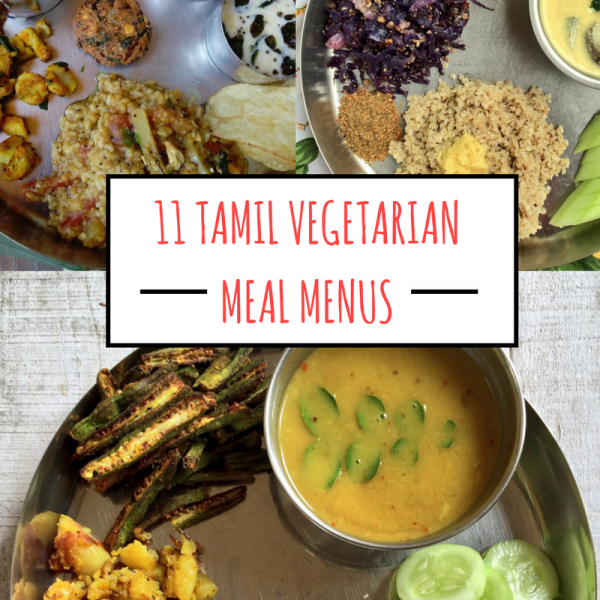 If you are looking to include more of this healthful ingredient in your diet, these are the recipes just for you! Quinoa not only works in stews but also in salads where you can combine it with whatever seasonal ingredients you find in your kitchen. Check out these simple quinoa recipes below. 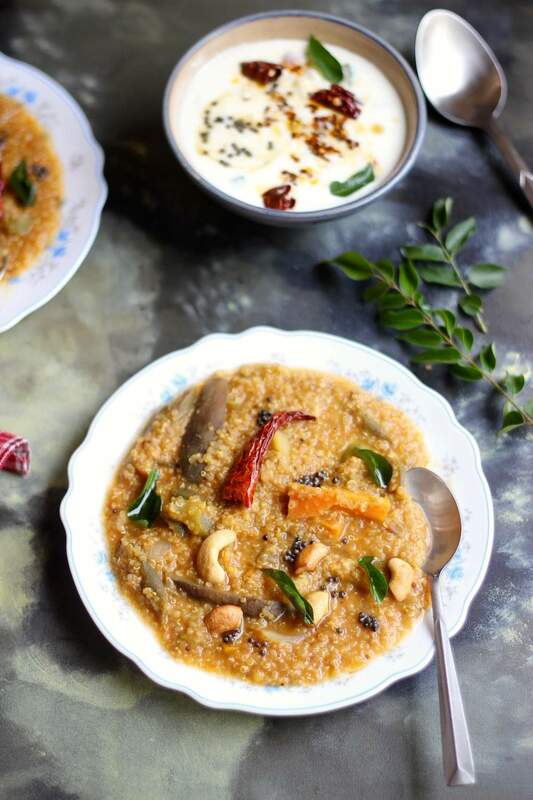 And here’s another delicious Indian quinoa recipe – the much popular Sabudana Khichdi made using quinoa and it tastes as good if not better. First step is to soak the quinoa for an hour or so. In some cases, quinoa has a bitter outer coating and soaking helps in reducing the bitterness to a great extent. Drain the quinoa into a fine mesh sieve. Scrub and wash the quinoa well. In a saucepan, combine this quinoa with 2 cups water and 1/2 tsp salt and boil for 8 minutes. Meanwhile, pressure cook the washed toor dal with 1.5 cups of water and turmeric. This process can also be done in an instant pot. Once the pressure has dropped, open the cooker and mash the dal well. In a large frying pan, heat the oil. Fry the fenugreek seeds, mustard seeds, curry leaves until the mustard pops. 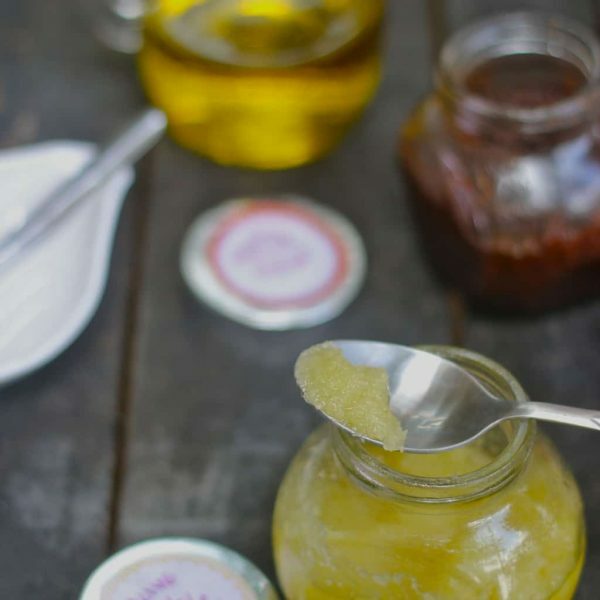 Stir in asafoetida (if using). Add all the prepared vegetables and stir on a high flame for 2 minutes. Pour 1 cup water into the pan, 1 tsp salt and cover and cook for 5-6 minutes until carrot is cooked. To this, add the tamarind paste and sambar powder and bring to a simmer. Add the cooked dal to this mix. Combine well. Check for salt, adding a little extra if required. The sambar is ready. To this add the nearly cooked quinoa. Let this boil together for 4-5 minutes. The quinoa will absorb quite a bit of the sambar. Cover and allow this to rest for one hour during which time the quinoa will absorb almost all of the liquids and it will turn into a semi-solid stew. Serve this South Indian style Quinoa Sambar Sadham with microwaved papads and raita. Prepare the same recipe using foxtail millet or brown rice. Sambar powder is available in all supermarkets in India or Indian stores abroad. In case you don't find sambar powder, use a mix of red chilli powder, coriander powder, turmeric and black pepper powder. Loved the reciepe. Sharing it.